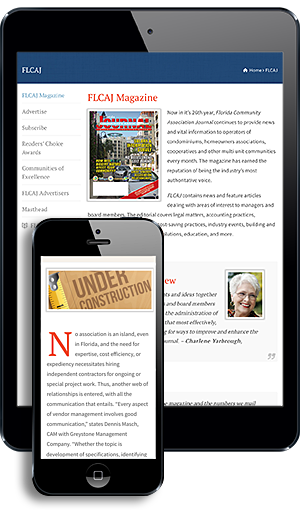 Editor’s Note: Florida Community Association Professionals (FCAP) is proud to announce that members can now take advantage of a special membership discount when using BPBALLOT, the new online voting system from Becker & Poliakoff. Donna Dimaggio Berger explains the concept here. For more information, members can visit www.bpballot.com and select the “FCAP Members” link under License Purchase. Q When did you launch BPBALLOT, and what has the response been thus far? A The response to our announcement almost four weeks ago about our Firm’s new, proprietary, secure online voting system for community associations, BPBALLOT, has been nothing short of astonishing. If that response is any indication of need, there have been many, many associations waiting for a solution to the typical problems associated with membership votes. For some communities, online voting offers the chance to combat traditional voter apathy. For communities with large percentages of out-of-state and out-of-the-country owners, BPBALLOT provides an opportunity for those owners who were basically disenfranchised under the current system to finally participate in important community decisions. Q Is online voting in widespread use in the U.S.? AThere are 18 states now who allow community association members to benefit from online voting: MD, FL, ND, KS, NM, NJ, VT, CT, IL, OK, PA, TX, WI, WA, DE, MN, OR, and SC. California failed to pass their law in 2014, but there is currently a movement to reintroduce it in the state legislature. Q What is the pricing for BPBALLOT? Is it based on a community’s size or the type of vote being taken? AThe pricing for BPBALLOT is a flat fee of $350 to use the voting software for annual retainer clients of Becker & Poliakoff, $550 for FCAP Members, and $750 for communities who are neither Becker & Poliakoff annual retainer clients nor FCAP members to use the voting software for each voting event. The price is not tied to the number of units, the percentage of members voting, or the type of community involved as the voting mechanics are the same. There is no subscription fee. You simply purchase the right to use the software each time you need to take a vote. You can combine several different types of votes on one ballot to equal one voting event, such as electing directors, waiving reserves, amending the documents, approving a material alteration, etc., so long as the voting is all tied to a single meeting. Q Is online voting only useful for elections? AOnline voting can be incredibly useful for elections, but it will be equally useful for all types of membership votes including the waiver of reserves, approving amendments, approving material alterations, reducing the financial reporting requirements, and more. Q What safeguards are built into the system to ensure that a member’s vote is truly secure? ABPBALLOT uses the same encryptions and cyphers as used in banking ACH transactions. A unique PIN number sent to the e-mail address provided by each owner (or mailed to an owner’s home) ensures secrecy. Owners are asked to create their own password to log on to cast their vote using standard security questions involving answers to questions like city of birth, mother’s maiden name, etc. Q We’ve recently heard about condominium communities in South Florida protesting election fraud. How does BPBALLOT address that problem? AYou only need to compare the current ability to forge a signature on a paper ballot, stuff a ballot box, or discard a ballot envelope to the much more sophisticated skills needed to hack into a computer and interrupt a ballot in transit electronically to understand that the latter voting method is much more secure. For an election vote, the board members experience BPBALLOT the same way as owners do. They use the same portal and the only ballot they can see is the ballot they personally cast. Q What kind of setup is required to use BPBALLOT? ABPBALLOT does not require an association to download any software or even to have an association website. Association members will simply log on to the BPBALLOT.com website from anywhere in the world to cast their votes. Q What about owners who do not want to embrace online voting? AAn association cannot force owners to vote online. For those who wish to continue casting their votes through the use of paper proxies and ballots, they must be allowed to do so. However, I suspect that the percentage of owners voting manually versus the percentage of owners voting online will dwindle over the coming years as word gets out about how much easier and less aggravating it is to cast an online vote. Q Are there any steps boards need to take before using online voting in their communities? ABoards must adopt a resolution which offers online voting as a voting option in the community. Boards must also obtain consent from their members to online voting. In communities where a considerable number of owners have also consented to receiving notices via electronic transmission, the savings in terms of time and costs when it comes to membership votes are even more significant. Some communities may also need to amend their governing documents, especially HOAs that do not permit nominations in advance or associations who have other document requirements that would make online voting less practical. Q What has been the most rewarding thing for you personally when it comes to BPBALLOT? AHearing the excitement in people’s voices when they ask about BPBALLOT and realize that this product might be the tool they need to finally make some long overdue changes in their community has made the many hours that went into BPBALLOT very worthwhile.